After a long hiatus, I am finally back to drawing! On a shoujo whim lately, this is my latest coloring page/ digi stamp inspired by 1980s shoujo anime. My first love is still 1960s-70s shoujo hehe. 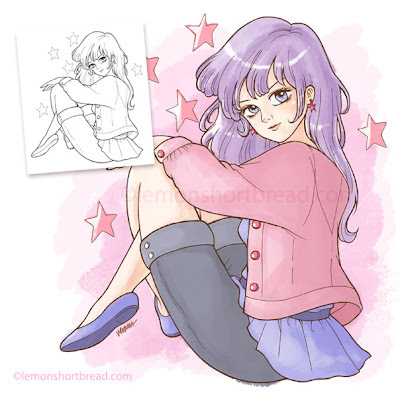 I coloured her in Photoshop as an example and she turned out rather Jem-looking! The lineart is available in my Etsy shop as a digital download for your crafting & scrapbooking, hope you like it.